Molecular and Applied Sciences Lab (MASL) - Michael Roberts, Ph.D.
Paul Roberson, a doctoral student in the School of Kinesiology’s Molecular and Applied Sciences Laboratory, directed by Dr. Mike Roberts, won best overall abstract presentation in the doctoral student category at the 2018 Southeastern American College of Sports Medicine Meeting in Chattanooga TN. Paul’s presentation was titled “Changes in amino acid transporters and metabolic proteins after 12 weeks of resistance training with varying supplementation.” This contest was highly competitive and involved over 100 posters from more than 10 states in Paul’s category. Congratulations Paul! 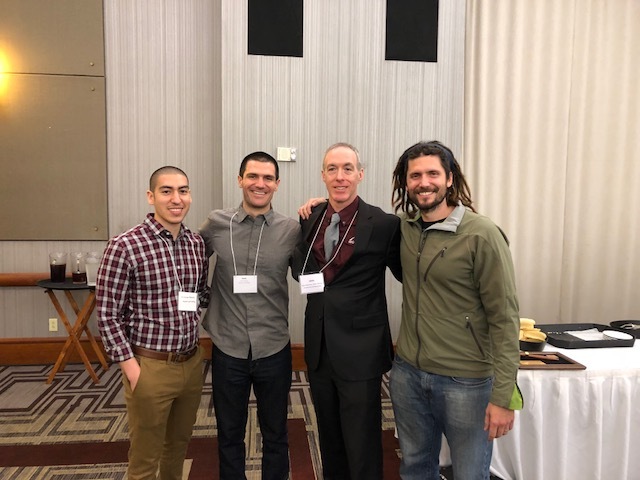 Pictured left to right at the Awards Banquet: Matt Romero (fellow Ph.D. student), Paul Roberson (winner), Dr. John Quindry (past SEACSM president and former faculty member in School of Kinesiology), and Dr. Michael Roberts (Paul’s mentor).